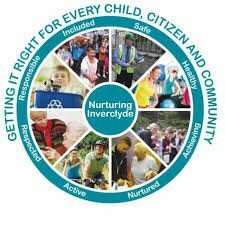 “Nurturing Inverclyde” is an approach which aims to make Inverclyde a place which nurtures all its citizens, ensuring that everyone has the opportunity to have a good quality of life and good mental and physical wellbeing. It puts the child at the centre and also recognises that every child grows up to become a citizen within Inverclyde and part of a community. Getting It Right For Every Child and young person is a national policy to help all children and young people grow, develop and reach their full potential. Its focus is to improve outcomes for children and their families based on a shared understanding of their well being.